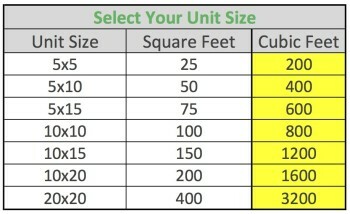 Use our size guide to help you determine what size unit you should rent. You can reserve online or by phone up to 30 days in advance. Search for the right storage location. Vista Storage of Green is conveniently located in Green, Ohio just south of SR619. We are less than two miles from I77. Select the size storage unit you need and reserve it. If you’re not sure how big a unit to reserve, use our size guide or call us at (330) 699-6880 to speak to a store manager who will take an inventory of your items and recommend the correct size. It’s like a hotel – you don’t need a reservation, but it’s better if you have one. With a reservation, you’ll be sure the unit size you want is reserved for you, and it will save you time on move-in day. You can reserve online or by phone up to 30 days in advance. You can rent in person in our office or you can call us at (330) 699-6880 to reserve by telephone. If our office is not open at the time you would like to move in, we can move you in remotely over the phone. A drive-up unit has a roll-up door and its own loading area. Just drive up to it and load your belongings in or out. These units don’t have any extra doors or hallways to navigate, so it’s easy to move things in and out. Yes! We have outdoor storage for vehicles as well as indoor storage for smaller vehicles. You can purchase a new, sealed lock at our office; each lock sold at our office comes with two keys. No one else has a key to that lock – just you. You can also bring your own lock, if you prefer. Do you have trucks available to rent for moving? Yes. We have a large selection of Uhaul moving trucks, vans and trailers to help you with your move. Please be sure to make a reservation for a moving truck prior to your arrival in order to insure we have the type of vehicle you need for your move. You will have access to your unit 7 days a week, 365 days a year, through the remote entry security system. During access hours, you can use your gate code to access your storage unit. During office hours, one of our Store Managers will be available to provide in-person customer service (like answering questions, selling supplies, accepting rental payment, etc). If I rent a storage unit from you, can my spouse, friend or business associates have access, too? When you rent from us you can allow access for other people you specify (or restrict access only to yourself). Simply designate an access code for them and the desired person will be granted access. You will also need to provide them with a key to the lock on your unit. If I forget my access code, what do I do? Call our Store Manager for assistance during regular business hours. Our leases are month-to-month agreements – no long-term lease is required. However, if you know you are going to be renting for an extended period be sure to ask one of our Store Managers about long-term lease incentives. The move-out process is easy: just let us know that you’re leaving and empty your storage unit. After you have moved out, we will inspect your unit to make sure it is clean and empty and will close out your account that day. You are responsible for the items that you store with us and insurance for your stored belongings is available for purchase from us, but is not required. You may be covered under an existing insurance policy. Be sure to check with your insurance agent to verify that your items are protected. For those without insurance coverage, or if you’re looking for a little more protection, affordable storage protection is available through Vista Storage. The Vista Storage Protection Plan requires no deductible, and is available in various levels of coverage, starting at only $6 per month. Yes. You can sign up for auto pay in our office or over the phone at the time of move-in or any time during your stay. We’ll automatically deduct your monthly charges from a credit card, debit card, or bank account. No bills, no checks to mail, no late fees. What if I’m late in making my payment? We bill monthly and all payments are due on the 1st of the month. However, we provide a 5-day grace period before charging a late fee of $15 on the 6th of the month. If you don’t pay by the 15th there is an additional $25 late fee assessed to your account. To avoid the possibility of late fees, we recommend customers sign up for auto pay, so that their payments are automatically taken from a bank account or credit card each month. If I don’t rent storage, can I still purchase moving and packing supplies? Yes. Anyone can purchase moving supplies at our office during regular business hours.